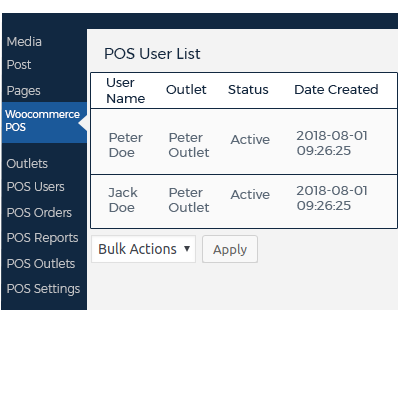 Point of Sale System for WooCommerce (POS Plugin): WooCommerce Point of Sale System is a brilliant plugin which provides store owners to have the functionality, where they can easily manage their online stores along with the physical stores / outlets. The physical stores will have a POS front-end management system for which the admin can assign a store agent who can easily manage the sales and customers at that particular store. Point of Sale System for WooCommerce (POS Plugin): WooCommerce Point of Sale System is a brilliant plugin which provides store owners to have the functionality, where they can easily manage their online stores along with the physical stores/outlets. The physical stores will have a POS front-end management system for which the admin can assign a store agent who can easily manage the sales and customers at that particular store. POS system can work both online and offline with the feature to synchronize all the sales and customer data of the offline store with the online store whenever going online. The module plays a vital role in increasing day-to-day sales by having a management system to manage online stores along with the physical stores. POS system will work with devices having a 1280 px screen resolution or above. Currently, we are working on to make the POS work with up to 768 screen resolution and above. For mobile devices – the user needs to develop the POS application for mobiles accordingly. For mobile application development, you can contact our mobile development team at support@webkul.com. For customized pricing rules based on products, categories, product variations, and global, please use POS Pricelist for WooCommerce. For better inventory management using barcode, you may use POS Barcode Inventory Management for WooCommerce. 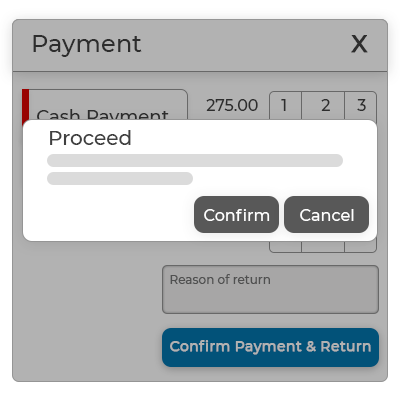 For refund management by POS cashier, you can use POS Order Return for WooCommerce. 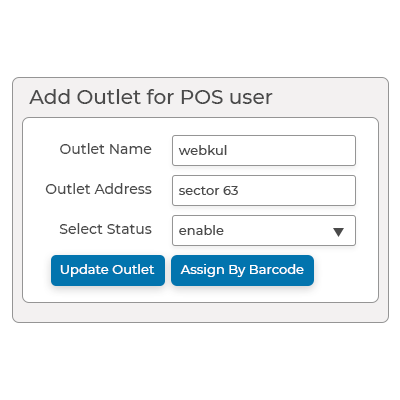 Create and manage multiple POS outlets. Create an order for registered as well as new customers. Apply discount offers as fixed amount or percent (%) value on the cart. Apply coupon code on the order. Add the custom product to the cart which is not available on the website. Hold the cart and proceed to the next transaction whenever required. Accept payment by cash and card. Generate barcode for simple as well as variable products. POS system work in online and offline mode both. The module supports real-time data synchronization. Create and manage sales agents for POS outlets. The admin can easily assign products to different outlets with their stock value by enabling the product for that particular store/outlet. The admin can assign different quantities to different variations of the variable product. The admin can assign infinite inventory to a POS product. The admin can generate barcodes for simple as well as variable products. The admin can print the required number of barcodes. The admin can manage the default settings for the POS from his end. The admin can manage the general settings, customer settings, barcode setting, and mass masterstock assign from his panel. 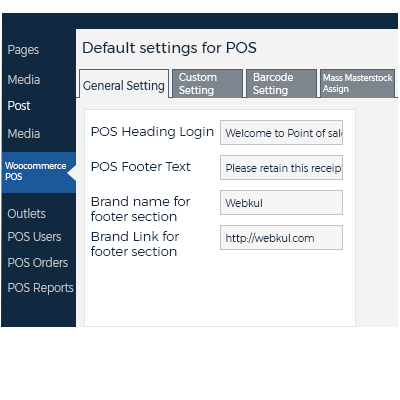 The admin can set the general settings for the POS like POS heading, POS footer text, brand name, no. of popular products, low stock warning, and invoice log. The admin can add details of the default customer which will be added to the cart if the POS user hasn’t added any customer to the cart during the check-out process. The admin can set the width of the barcode to appear on the products accordingly. 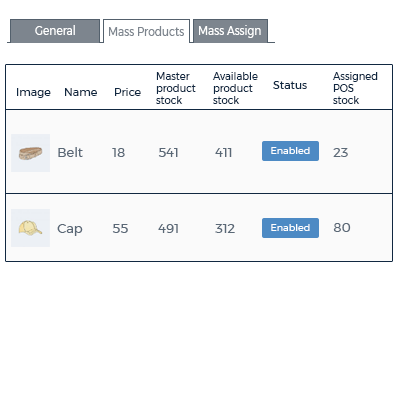 The admin can assign master stock to all products(in bulk) at a time. The POS user/agent can manage the sales and customers of the assigned outlet using several options to manage the POS System. POS agent can synchronize the sales data (recorded in offline mode) of the outlet with the online store whenever going online. The admin can view POS reports for a specific time duration(year, last month, this month, last week) or custom time duration. The admin can view POS sales report according to date, product, category and coupon code. The admin can view POS customer report like - total spent money, number of orders and so on. Display POS stock report – low stock, out of stock and most stock products. Display POS tax reports according to the tax code and date. The POS agent can place an order in offline mode. POS agent cannot add, edit, delete customer in offline mode. POS agent cannot apply coupons in offline mode. The POS agent can work in offline mode whenever there is bad connectivity and can synchronize the data with the online store whenever going online. The POS agent can set the currency for the store available in the currency settings from his panel. The changed currency will be applied to all the products. The changed currency will be displayed at cart page as well. The POS agent can apply a coupon to selected orders if there is a coupon available for the same. The POS agent can apply coupons & discounts to the cart. Discount may be applied to the cart item in two ways, percentage-wise and as Flat Discount. 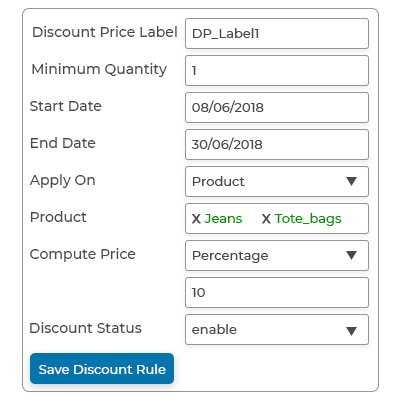 If there is a product added to the cart for which the coupon is applicable, then the product value gets discounted based on the coupon which will be reflected in the grand total of the cart. Offer discounts on products on the basis of Pricelist Rules. These Pricelist Rules are applicable to Products, Product Category, Product Variations and also on the entire store or Globally for a given time period. The admin can easily scan the barcode to assign the product to the outlet. The admin can search a product using barcodes and update the product inventory. The admin can search a product using product id and update the product inventory. Using a barcode reader, the searching products is made easy and manual labor in searching products one at a time is reduced. This is an efficient and convenient way to manage the product inventory. The customer may request for a refund in case of a faulty product or if the product does not meets customer's expectation. Allows POS manager/cashier to process refund requests for customers at retail outlets. POS manager/cashier can return the full amount or a partial amount of the order. Inventory for the products will be managed and updated automatically once the refund is in process. The admin can assign masterstock to all products at a time. POS agent can sell a custom product which is not available on the website. The admin can view POS reports for a specific time duration(yearly, last month, this month, last week ) or custom duration. 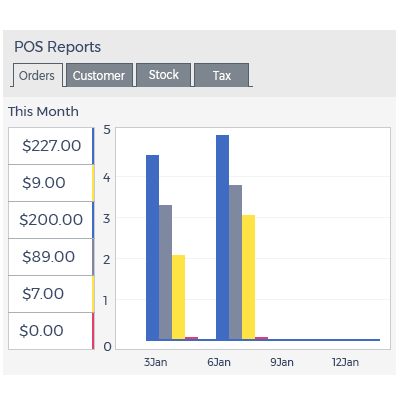 The admin can view POS customer report like – totally spent money, number of orders etc. The admin can view POS stock report – low stock, out of stock and most stock products. The admin can view POS tax reports according to the tax code and date. Did you buy Point of Sale System for WooCommerce (POS Plugin)? I like their customer support, and it made me feel comfortable when using their plugin, especially when I run into troubles like barcodes, and there are more issues that I found, and they have quickly fixed it for me. I really love it! Thanks a lot for your support and care! I highly recommended that you buy their plugin! You won't regret it! Awesome products with great customer support. Thank you webkul. How does POS system work with offline mode? How many agents can the admin assign to a POS outlet? The admin can assign only one agent to a POS outlet. The hardware connectivity depends on the device if the device supports the Bluetooth printer, barcode reader and RFID card reader then the POS will also support the same. How do I connect credit/debit card swipe machine with Magento 2 POS System? As this is a Web-based POS, card swipe machine cannot be directly connected with Magento 2 POS System. No information or data is exchanged between POS Device and Card Swipe Machine. While making payment using card swipe, this has to be managed outside the POS system. Can the admin manage the different quantity of the products for the different outlets? Yes, the admin can manage the different quantity of the same product for the different outlets. Can POS agent place an order for a product which is not available on the website? Yes, the POS agent can place an order for a product which is not available on the website. What is the masterstroke in the POS system? The total quantity of the product on the website is called " Masterstock". More information click here.